Are you stuck staring at your brand’s arsenal of content wondering why it isn’t selling? You’ve probably spent hours investing your personal time, money and resources writing countless pieces, only to realize your copy isn’t converting to mind-blowing sales. Maybe you’ve looked to content creation tools and software, business coaches, and outsourced copywriters for the answers—a quick fix. But, ultimately, your conversion rates are crushing your hopes and dreams, and it’s time to get to the root of the problem. If you’ve felt any of the above, you’re not alone. Even the most seasoned copywriters have been in your shoes. When it comes to reaching and communicating with your ideal customers, it takes time and practice to understand what works and what doesn’t. There’s no quick fix. You’re left without the answers as to why your copy isn’t selling like you think it should. But the answers are within reach, and I’m here to share them with you! The days of wanting to slam your computer to the ground are over. 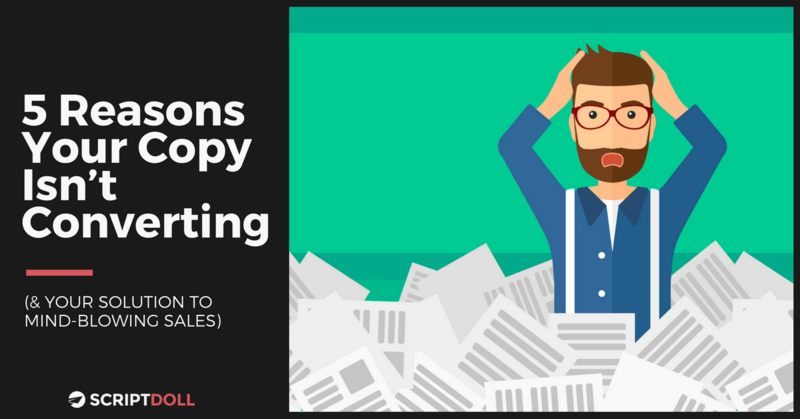 Even after discovering the reasons as to why your copy isn’t converting, however, it can still be challenging and incredibly time consuming to write content that sells. I’ve got just the solution for that too, which I’ll share with you right after I walk you through the following five points. Stay tuned to discover how you can crank out multiple conversion-worthy content pieces in a matter of minutes! 1. You don’t have a clue who you’re talking to. Are you trying to get everyone’s attention in your copy? Well, forget about it. It’s about time you get specific with the words sprinkled across your sales pages. When you first started, maybe you thought it was better to be something for everyone. You saw everyone as a potential customer or client. You’ll find more success, however, when you try to be something to only some people. Who do you want to sell to? Most of all, who do you not want to sell to? Don’t be afraid to alienate others. When you cast a wide net, you’re basically asking to lose the attention of your audience in a heartbeat. Pick your current customers’ brains and ask them questions like: What makes you tick? Why do you want what you want? The more questions you ask, the easier it’ll be to speak directly to your niche and get personal. Think of it this way: you and your ideal customer are sitting across from one another having coffee. Converse with them through the screen in that same tone and interest—it’s all about them versus you, you, you. Trust me, you’ll find yourself getting more sales when you start speaking your target audience’s lingo and making your content relevant to them. 2. You’re not solving the “Tip of the Iceberg” problem for your audience. Let’s say you’re heading out on vacation tomorrow to a tropical destination—how about Aruba? (sigh…how nice does that sound?) Are you focusing more on the plane ride or the destination? You’re ready for some R&R and to soak up the sun, so, of course it’s the destination. Well, that’s exactly what your customer is most focused on, too—the end goal, the landing place. Okay, maybe they do want to know some details about how your software or product ultimately works. But, no, not right off the bat. Ultimately, all your audience cares about at first is whether or not your product or service solves their biggest, most urgent obstacle—the “Tip of the Iceberg.” The obstacle they’re mulling over at wee hours of the morning. You may find yourself wanting to rush ahead and offer up solutions to problems your target customer isn’t truly aware they even need. I realize you’re just so eager and excited to share all there is to know about your product or service. Yet, I advise you to take it one step at a time. After you get past the “Tip of the Iceberg,” you’ll be able to solve the “Under the Water” headache that keeps your customers and clients up late at night. 3. You’re not telling a story. A good one. What was your “aha” moment? Better yet, what was your “oh crap” moment that led you to creating a product or service you believe your audience wants and, ultimately, needs? It’s okay if you don’t want to open up your entire “business diary” to share with the webosphere. But, you can’t just let some great lessons and stories about your brand fall by the wayside. Storytelling is part of the process of building credibility—it’s a must-do before asking your customers to offer up a single cent. The more you let your audience in, the more they begin to trust you. Let them in on your failures and how those moments brought you towards success. Let them in on what your product or service did for customers just like them. This establishes the “just like you” mindset. For instance, “My customer was in your shoes a year ago, and look where they are today, thanks in part to my product/service.” Ultimately, just be real and humanize your brand. Tug on their heartstrings and don’t hesitate to drizzle a little emotion onto your content. It’s pure gold for your communication strategy, which will unlock that pesky conversion vault. 4. You’re not sharing what makes your product/service a unicorn in a world full of horses. So, if you haven’t already, ask yourself, “Why would someone want to invest in my product/service over everyone else’s?” A lower cost of investment, a more hands-on approach, an untapped ingredient/feature/benefit? Whatever it is, set yourself apart from the herd of horses and showcase what it is exactly that makes your product or service a real-life unicorn. And, don’t be shy. When sharing what makes you unique, more weight is added to your side of the scale. As a result, the customer will have an easier time making a decision. 5. Your headlines are seriously lacking in the creative department. Your big shot at reeling in your reader is a compelling headline. In a matter of seconds, you have the chance to make a slam dunk and pique their interest. On the other hand, you can quickly throw an air ball and turn them off, making them not want to stick around one second longer. Which would you prefer? The former, I’m sure. The point is, a headline is the gateway to your content. One that blows your reader’s mind will encourage them to dive in a little deeper and read the rest of what you have to say. And, if that happens, there’s a greater opportunity for your product or service to sell! Take time to think about what could make your headline POP. A few words moved around here and there, adding in #s and teasing the solution to the big problem can make all the difference! Still stuck on how to write copy that shines and sells in minutes? I get it. It can be a tedious, daunting and (a tad bit) stressful task to gather all your thoughts, transfer them to a blank online document and communicate them in a way that translates to conversions. But, what if I told you there’s a unique piece of software available at your fingertips, dedicated to making the writing process less of a hassle? Yes, it’s true! ScriptDoll, a sales copy engine, helps aspiring and even the most seasoned of copywriters create persuasive sales copy in a matter of minutes. It takes all the guesswork out of the writing process. You’ll be able to keep your head out of the weeds, focusing on the success and growth of your business. Does it sound too good to be true? I thought so too at first, but it truly works and helps you hit a content homerun! Saves customers time writing sales copy—simply complete your product portfolio, answer a handful of painless questions and ScriptDoll turns your answers into engaging copy that will encourage sales. Best thing is, there’s no longer a need to start from scratch to create top-notch content! Offers access to an ever-growing, extensive library of content templates—following completion of your product portfolio, you can craft sales letters, email sequences, video sales scripts, native ads and much more at the touch of a button. Not to mention, new templates are added on a monthly basis, ensuring your audience won’t get tired of hearing the same thing from you over and over again. Allows customers the opportunity to keep their copywriting in-house—there’s no need to spend thousands of dollars outsourcing your writing tasks to copywriters. ScriptDoll crafts its effective templates thanks to its connections with some serious “superhero” copywriters around the world! Creates ready-made profiles on a monthly basis—are you a puppy trainer, dentist, plastic surgeon or graphic designer? If so, you’re in luck because your product portfolio has already been completed for you. Many more ready-made profiles are waiting to be used within the software engine. It will be that much easier to push out content that converts! So, now that I’ve introduced you to what ScriptDoll is and what it can do for you, take a few minutes to daydream about what your life would be like while using this software. Can you envision more time freed up from your hectic schedule? Countless hours saved from generating content that, for some reason or another, ends up falling short of conversions? When thinking about all the copy work being taken off your desk, are you breathing a sigh of relief? I thought so. All you have to do is have some simple ingredients ready to go: your target audience, what you’ve got for them (product), a list of key features/benefits and your personal story to success. After mixing all those key pieces together, ScriptDoll will whip up content that your audience can’t help but eat up. Get Your Product’s Conversion-Worthy Copy Today! It’s time to make your copy dreams and conversion goals a reality. And you can do so today! Finally you have the answers you need in your back pocket as to why your copy isn’t converting. And, most importantly, a solution to quickly and effectively write persuasive sales pieces. The success stories keep coming from customers using ScriptDoll, and they’re kicking their conversion rates up a few notches with little to no effort. So, we hope you’ll join them and look forward to you getting the results you’ve been hungry for. They’re ready and waiting for you! Access Copy that Sells Today – Join ScriptDoll!